When you grow up in Southern California, you take a certain amount of Mexican culture for granted. There’s a pinata at every birthday party. Tortillas and salsa are always in your pantry, and your idea of comfort food is a bean and cheese burrito. Mariachi and banda music makes you happy and reminds you of home. But there’s a deeper layer of culture you can’t get to unless you’re part of the familia. So when my friend Marisa’s family invited me over to help make tamales after thanksgiving, I was very excited, and hugely honored. 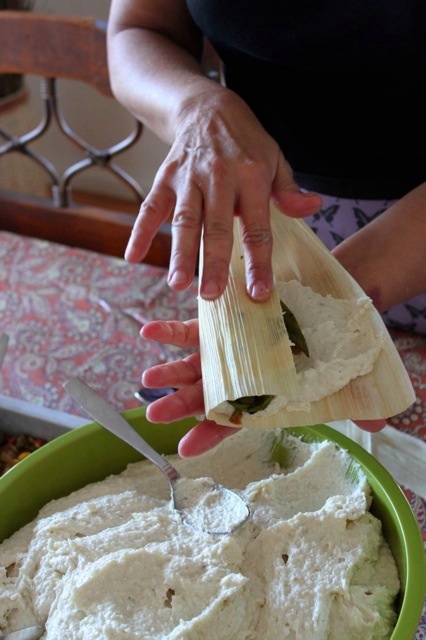 Tamale making is an involved, all-day process. 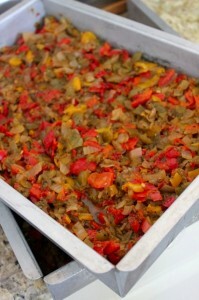 In Mexican families it brings together the generations to cook, eat, drink, make merry and pass down traditions. 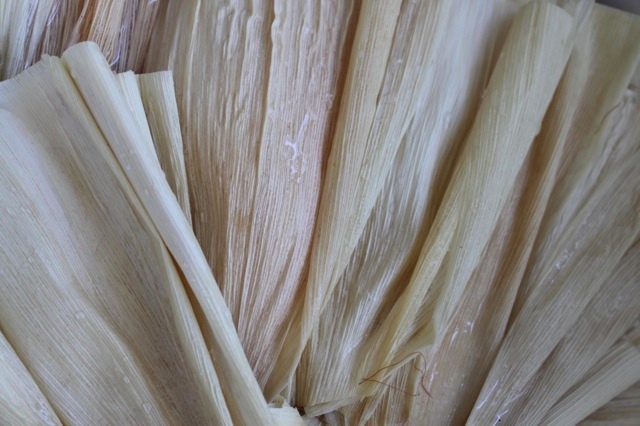 Lots of native Southern Californians, regardless of ethnicity, buy tamales over the holidays. But getting to take part in their making? There’s no better holiday celebration. I’m not including any “recipe” because it varies from family to family. Indeed, the recipes for the masa and the fillings are often closely-held family secrets, passed down from mother to daughter and not readily given up to outsiders. What I’m describing here is the basic process involved, because it was all new to me. In years past the family made their own masa, but this year, because it was a smaller group, they purchased 35 pounds of masa, (from a particular shop in Montebello; name not indulged and I didn’t pry). It came in two heavy sacks. The consistency was like mashed potatoes. It seemed like a huge amount to me, but not so. 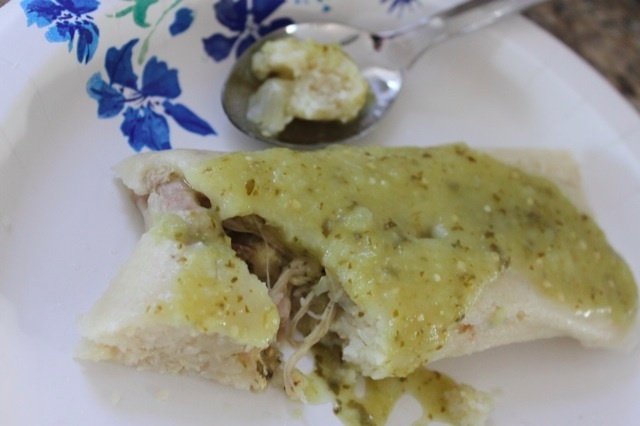 At one time the family would make so many tamales they used more than a hundred pounds of masa, and employed a cement mixer and industrial paddle to stir it up. This year we processed it in a KitchenAid, thinning it out in batches with home-made chicken stock until it was more the consistency of biscuit dough. As we prepared the other ingredients, I heard tales of a family matriarch, a little old abuela, standing over the cement mixer working the paddle like a construction worker, humming to herself. While preparing the masa, you have to also prepare the corn husks by soaking them in water until they’re pliable. We did this in the kitchen sink. Here’s where I should point out that there’s a pecking order when it comes to the assembly-line of tamale making. 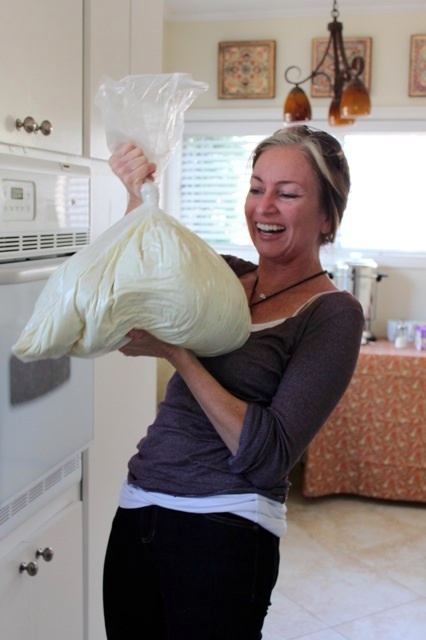 The children (or complete noobies, like, ah, me and another guest) do the simple chores like soaking the corn husks and cleaning them of silks, wrapping and bagging. The more experienced spread the masa into the corn husks, add the ingredients, and fold the tamales themselves. First the prep: We cut a five-pound loaf of cheese into sticks, (a child’s job, but they still had to cut mine again to make them the right size…cough) prepared the masa, got the corn husks in order, and set out the fillings, which, this year, included roasted peppers, green chilies, and chicken, all home-made by my hostess. We were ready to start assembling the tamales. The two senior women, my hostess and her sister, were in charge of spreading the masa into the corn husks, which had to be done just so. From there the fillings were added. …to those of us low on the totem pole. 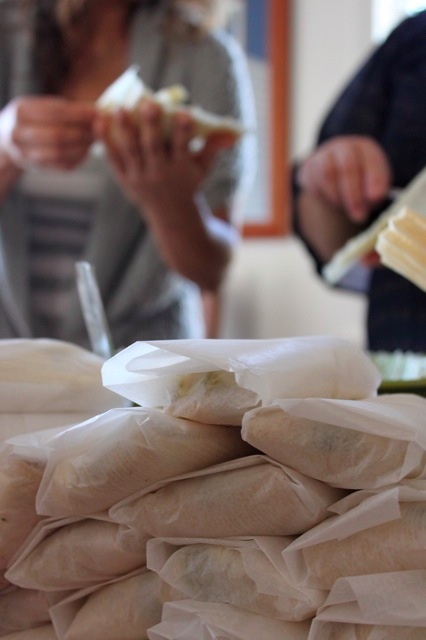 Each tamale is then wrapped in parchment paper and carefully stacked so they can be bagged and marked – by the dozen — for distribution to friends and family later on. There’s a certain way to wrap them — Marisa had to show me several times — because they have to be snug so the filling doesn’t fall out while being transported and/or steamed. This was my pile. Can't you tell? 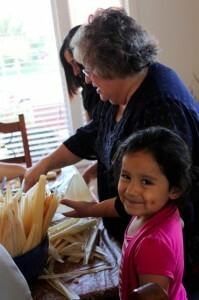 As we made the tamales, we talked and snacked and laughed. It was too early in the day for wine, but I’m told it’s a regular part of the festivities when the assembly goes into the afternoon and evening hours. It’s very time-consuming, but the best kind of busy-work; productive, social, and nurturing. And this was a small gathering, relative to year’s past. I wondered what kind of scene it would be with twice as many people on the assembly line. Twice the fun, I imagine. What I enjoyed most (and as you can imagine, I was enjoying all of it) was the fact that everyone had obviously done this many times before and knew just what to do. A cousin stopped by with his wife and small children, and without missing a beat began marking bags. Even the little kids got involved. By this time I was starving. The aroma of fresh chili peppers and shredded chicken was tormenting me, and even though our hostess had set out coffee and pan dulce for us to enjoy that morning, I couldn’t wait to sink my teeth into a tamale. A fresh tamale will take about 45 minutes to steam. If you’ve bought a dozen and froze them, put the desired number you want to steam into the fridge and let thaw overnight before steaming. Here’s a hint: Put out more than you think you’ll want. Because they’re small and delicious, and you’ll always want more than you’ve got ready. We stuffed and wrapped and bagged. At one point Marisa and I had to run out to buy more cheese. 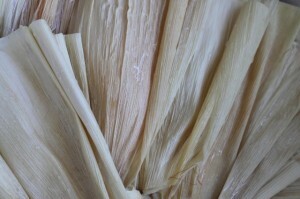 When we returned, the test tamales were just about done. 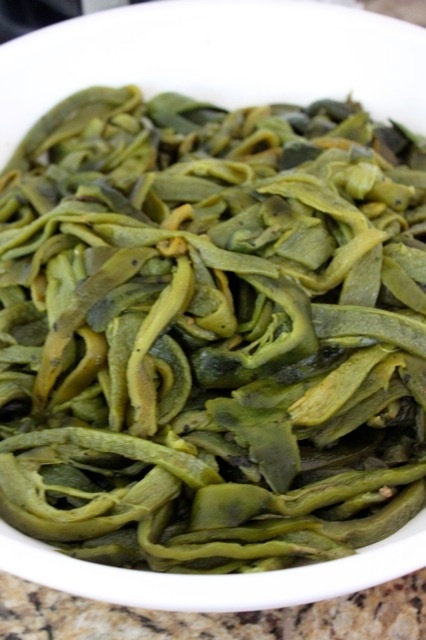 Our hostess carefully removed them from the steamer, opened the wraps, then the husks, checked them …and deemed them worthy. She put one for each of us on a paper plate. I covered mine in her delicious green sauce. Success? We finished the masa in the early afternoon. 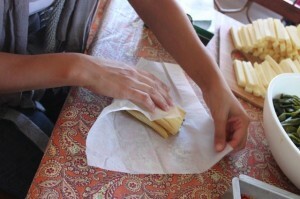 More than 16 dozen tamales had been bagged and marked and sat neatly nearby. 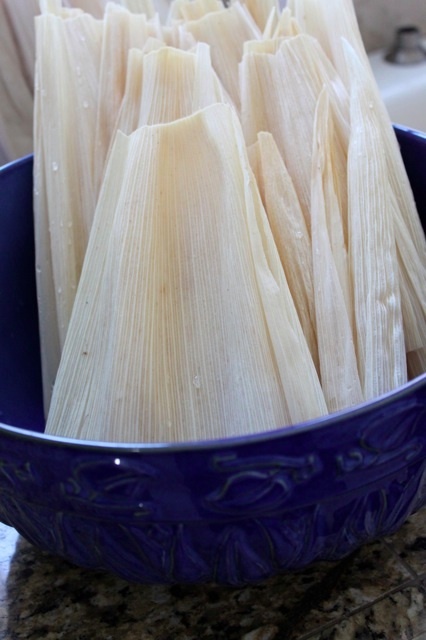 I hadn’t realized the final bonus of being invited to make tamales: cheap tamales! Good luck trying to buy a dozen home-made tamales for less than $16. 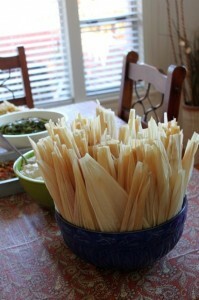 Once the cost of the ingredients was divided by the number of tamale makers, my cost came to $6 a dozen. I took home two. And only because I didn’t want to seem greedy and impolite. I would happily have popped for five. Would I make these myself ever? I suppose I could learn to. It would be an incredibly labor-intensive process to do it myself, and in fact, that defeats the purpose. It’s a family-affair, and without a houseful of tias and nińos and music and food and family gossip, you might as well just go to the Del Taco. What a memorable way to spend the Saturday after Thanksgiving. ¡Muchísimas gracias! Lovely heart-warmed story. Thank you for joining mi familia to make the annual tamales. So Jules, time to start a new annual cooking tradition in your family. Don’t forget to invite! It was a pleasure having you at my house and sharing in our traditional. You did a great job!! 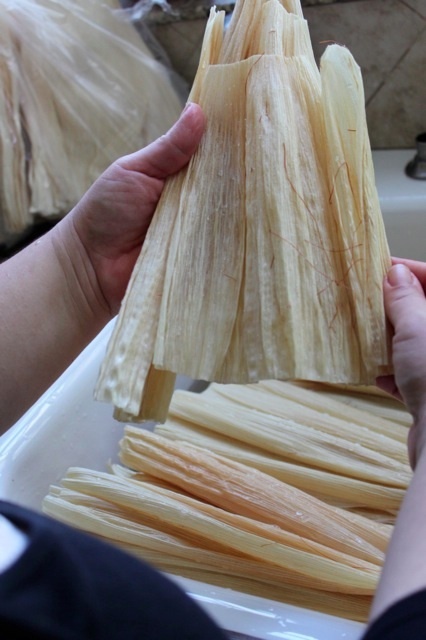 Many, many years ago I was invited into the inner sanctum of wisened tamale making geniuses and remember it fondly to this day (I felt so priveleged – because at that time I couldn’t cook and or speak a lick of spanish). Tamale making breaks the language barrier…it just may be the answer to world peace. We made two different kinds – chicken with green chiles and pork ones where the masa had raisins. YUM! One of the benefits of living in Long Beach. 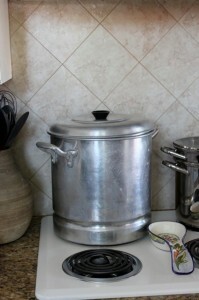 For years, we have been going next door to make Christmas tamales while listening to ranchera music. Awesome! Now I want tamales. Gorgeous post! I can see the whole party in my head! You, my dear, are one extremely talented writer. I thank you for sharing your experience with us. You make it like we were there. Happy Holidays. Such a great story. Thank you for sharing. I believe my mom and I were able to be guests one time many, many years ago (thank you, Mary and Marisa!). 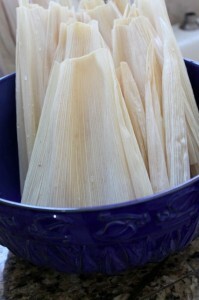 Definitely something I miss living in Pittsburgh — we can’t get tamales during the holidays. Previous post: Pumpkin Pie EPIC FAIL!